Flexible pipes: High Pressure hoses for the hydraulic jacks can be supplied at extra cost. These pipes are available in 1 meter length with end connections. Set of platens for self aligning action. Usage/Application: To Lift Midsize Commercial Vehicle or project use. 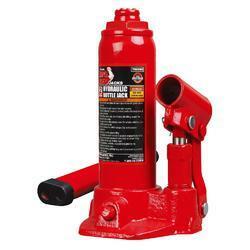 We are presenting an excellent quality assortment of Hydraulic Bottle Jack. Our range of Heavy Duty Mechanical Screw Jack are available at market leading price. We are amongst the reputed organizations, highly engaged in offering an optimum quality range of 20 Tons Hydraulic Bottle Jack. We are a leading name in supplying of Hydraulic Bottle Jacks. 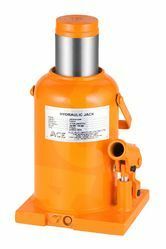 We are supplying, wholesaling, exporting and trading of high quality Hydraulic Bottle Jacks in the market. We provide these items which are in compliance with international safety standards. We are in a wide demand among our clients due to the outstanding quality of safety products we offer to our clients. We offer a wide range of Hydraulic Bottle Jacks. The highly efficient, bottle jacks are manufactured using fine quality raw material such as carbon and steel which is sourced from the trusted vendors. Hydraulic Bottle Jack available with us is used in numerous industrial segments.